Myth 1: Synthetic oils are too thin to stay in the engine. This is not true. In order for a lubricant to be classified in any SAE grade (10W-30, 10W-40, etc. ), it has to meet the viscosity guidelines, or thickness, specified by the vehicle manufacturer. Myth 2: Synthetic oils will void manufacturers’ warranties. Synthetic oils will not void manufacturer warranties. They are formulated with the requirements of the auto manufacturers in mind, and so if they’re used in accordance with the owner’s manual, synthetic oils will not void any of the warranties. The only exception is that full synthetic oils should not be used in Mazda rotary engines, which have unique and specific lubrication requirements. Always check the vehicle owner’s manual. 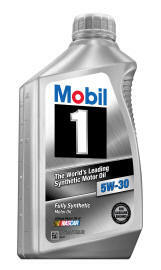 Myth 3: You can’t switch between conventional oil and synthetic oil. Switching between synthetic and conventional oil will not cause any harm to engines. Synthetic oils and conventional oils are formulated to help protect your emission system, including oxygen sensors and catalytic converters. Myth 4: Synthetic oil will make seals leak. If an older engine’s seals do not leak with conventional oil, they will not leak after switching to synthetic oil. Synthetic oils do not damage engine seals in an engine of any age. Myth 5: Synthetic oil cannot be used to “break in” a rebuilt engine. In a rebuilt engine, a certain amount of controlled wear can be expected to occur to allow piston rings to “seat” and the engine to “break in.” Synthetic oil may be used for the “break-in” period and throughout the life of the engine. Synthetic base oils combined with a strong additive package allow synthetic oils to perform better than conventional motor oils under virtually all conditions.